Four months ago, when we landed in Asia, people started talking to us about Nepal. Whoa, Nepal you say? That place-name carries a hint of the dreamy to my northwest Washington mountain-yearning ears. We started looking into it. Our bags were full of snorkeling masks, flip-flops and surf shorts, not sleeping bags, wool hats and gloves. No matter, a few great people from the International School of Kuala Lumpur (ISKL) sorted us out with long underwear, down coats, gloves and hats. Thanks Max, Lisa, Jasmine, Kevin, chad and Heidi! Unfortunately, we had waited too long to book flights, so prices were double what they were two months ago. Oops. Oh well, thanks VISA! We hadn’t researched where to go, but throughout SE Asia, we kept running into other travelers with Nepal connections. Ant and Keri trekked in March, and gave us great on-the-ground reports. We met Cailey and Rob, a wonderful US couple we met in the back of a taxi in Chiangmai, then again on the slow boat to Luang Prabang. They are currently on the Everest base camp route for three months doing research on health effects at altitude. They were inspirational in giving ideas about trekking regions. Several ISKL teachers had trekked with a company, Api Himal, that also does some good social work in Kathmandu. 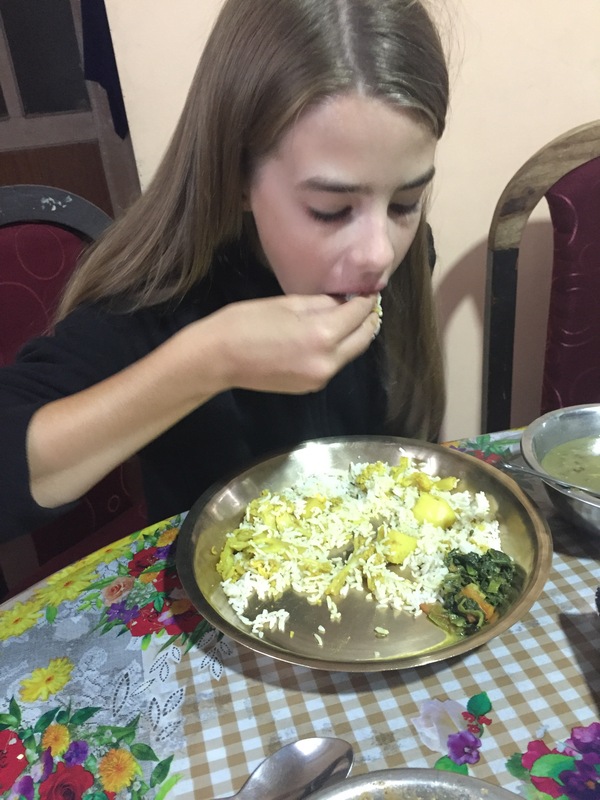 I emailed Rajendra, the founder/owner/boss man, and together we settled on a plan – a seven day trek to Annapurna region (actually the “Poonhill trek”). 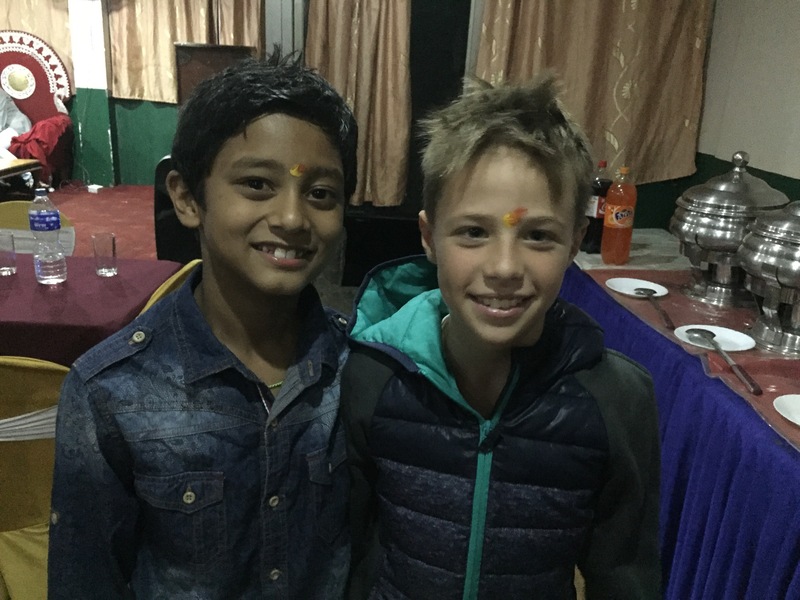 Since we were going to be in Nepal for 13 days, Rajendra also arranged some other activities for us, including an invitation to stay at his home/orphanage for two days before heading out on the trek. Little did we know how amazing this would be. 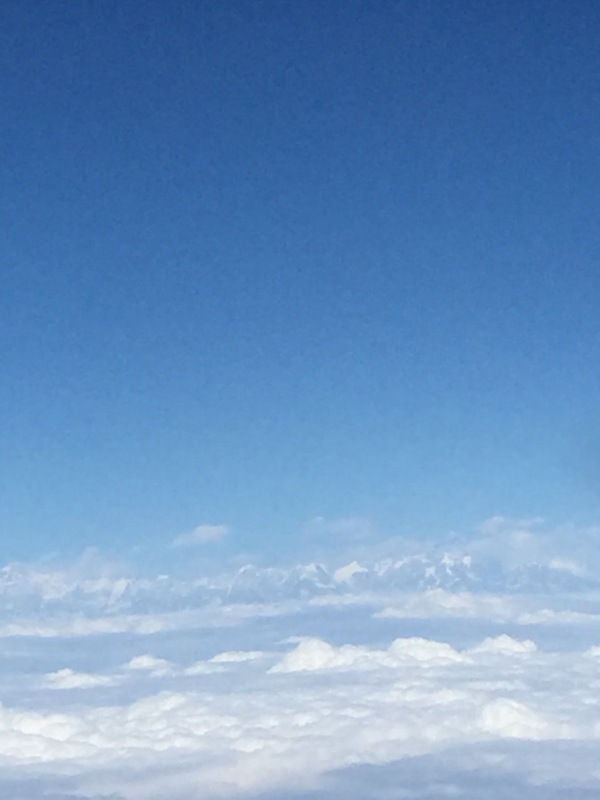 The flight in was stunning with wide views of the Himalaya, with Everest nearly at level with our plane. At the airport, Rajendra met us with a warm namaste, and deep smiles. We drove the colorful streets of Kathmandu back towards his home, and second business, OCEAN Nepal, a non-profit orphanage. His brief story is that he was working as a trekking guide, and decided (along with his wife, who is an incredibly vivacious, funny and beautiful woman), to do something for kids who come from difficult circumstances. He started an orphanage, and used his trekking company to help support the orphanage – that is some smart eco-tourism/social work! Arriving at his home, Rajendra invited us to tea (I love masala tea! ), and introduced us to several of the kids. I was blown away by this group of confident, intelligent, funny young people. The home has 8 boys and 8 girls, aged 6 to 19. They seem to behave like one big family. Older kids tutor the younger. They kid around with each other and seem to generally love each other. We ended up spending most of our Kathmandu time hanging out at the home. 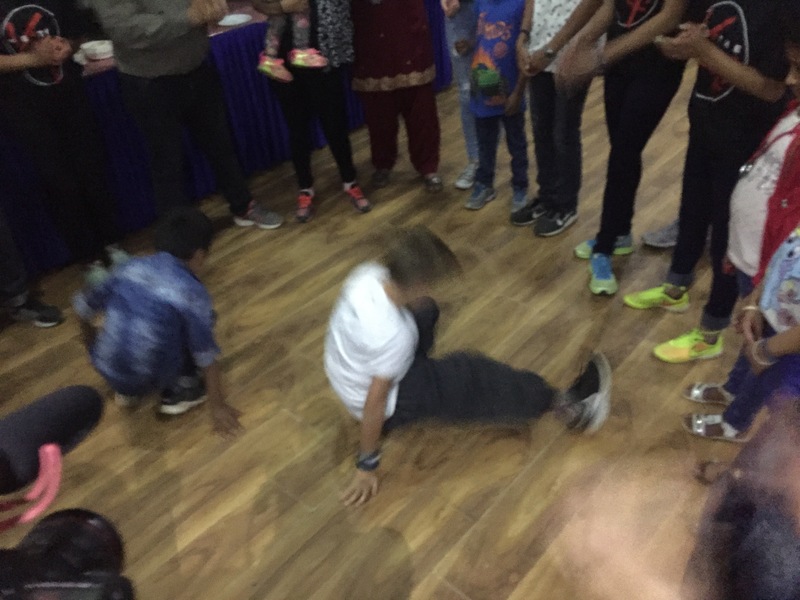 The Nepalese kids spoke excellent English, and were eager to make new friends. I played guitar and chess, and was humbled in both accounts by teenagers. Porter jumped into lego-play with some of the younger boys. Amy and our kids joined a bracelet-making group. 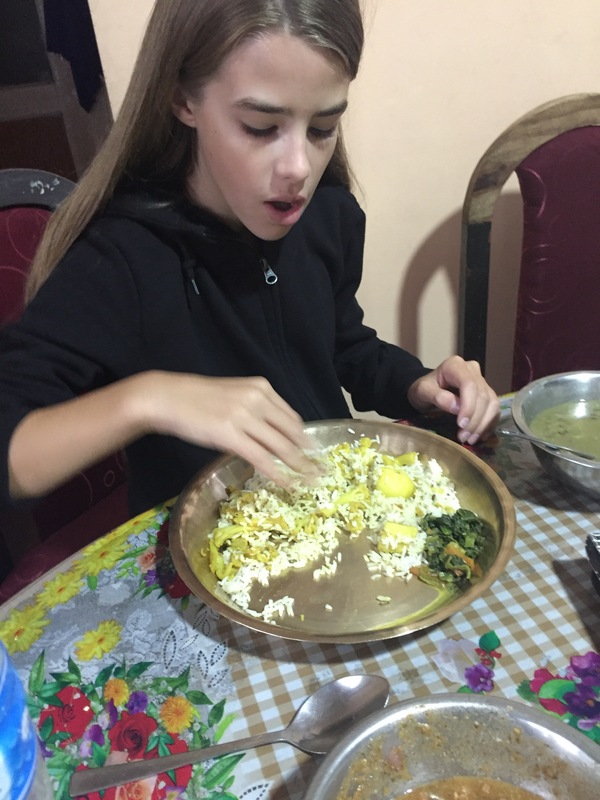 We ate dinner with Rajendra and his family, where we were introduced to eating with one’s hands. 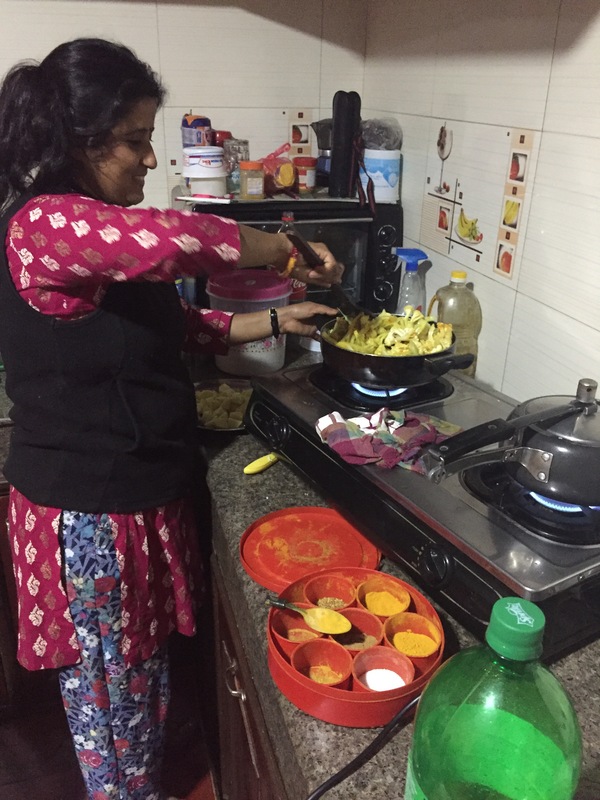 We had delicious rice-Dahl-cauliflower-and-potatos. Even mia got into the spirit of hand eating. This is for you Ana z! 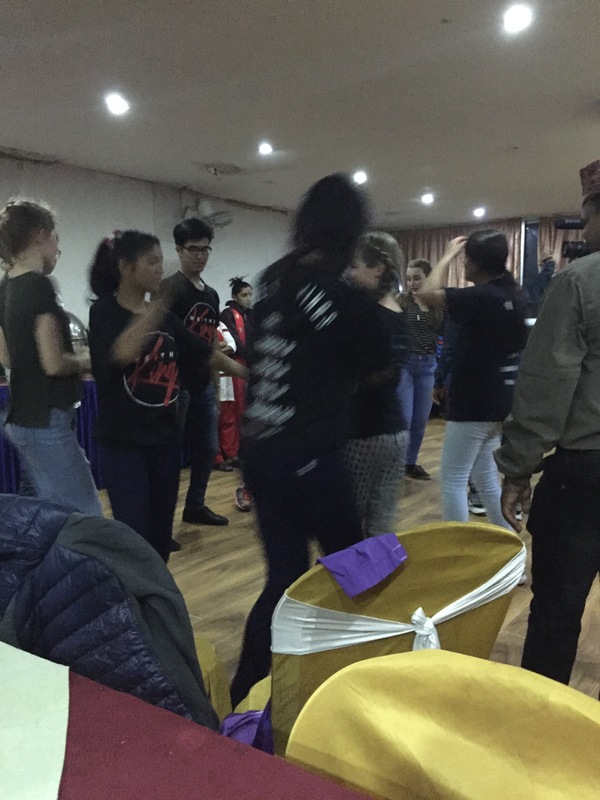 We had one down day in Kathmandu before leaving for our trek. Luckliy for us, it coincided with the visit of a group from the American Community school of Abu Dabai. Four teens and their parents were on a service trip to the orphanage. 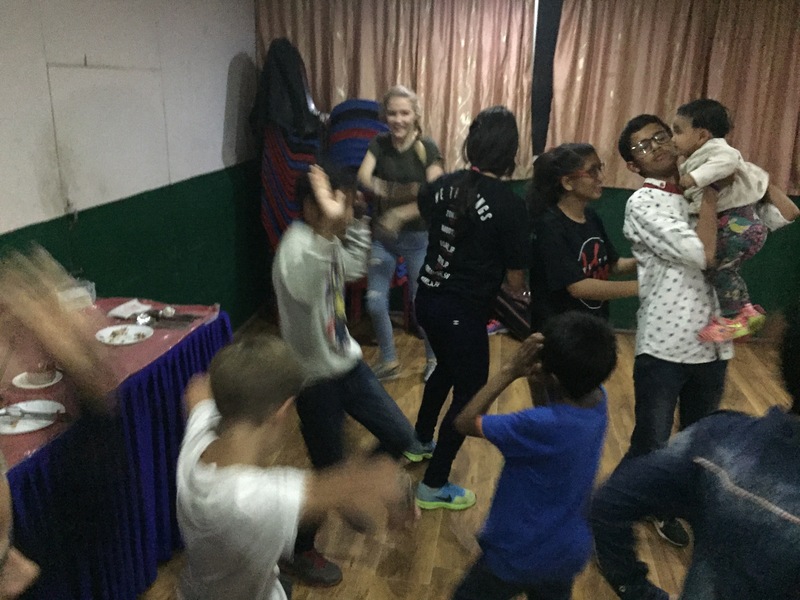 We were able to join in the end-of-visit banquet, complete with a full dance party to a mix of western, Nepalese and Indian pop music. So fun! In one very short day, we’ve been moved by the big hearts of Nepalese people. On to trekking! I love reading your posts John!! I hope you can make this a book someday!! Stay safe and keep writing! Tell everyone “Hi”for me!!! It is so neat all the things the kids have been doing. My mom and I show Dylan and Kaine all the great things the kids have been experiencing. What a fabulous welcome to Nepal! I can’t wait for drooling beautiful mountain pics! I am breathless! What’s next? The moon? Thanks Jamey, your stories and advice were instrumental. It’s good to be home though!